America fashion sorely lacks authoritative voices. Raf Simons exited Calvin Klein following a poor commercial response to his collections. Marc Jacobs is still around but he relies heavily on his own archive to push things in a new direction. Helmut Lang left the fashion industry even though the ghost of his aesthetic presides over most collections. (Editor-in-residence Alix Browne will endeavour to revive the Lang project next week.) 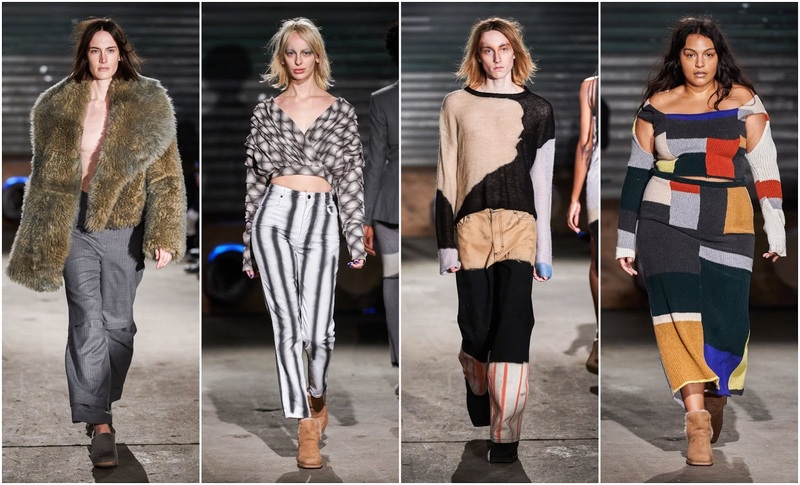 But America’s got talent, as we saw on Saturday afternoon at New York Fashion Week at the Eckhaus Latta and Brandon Maxwell presentations. Mike Eckhaus and Zoe Latta, the design duo behind Eckhaus Latta, refined their ‘awkward/art school’ aesthetic with a collection that sang to the heart of commerce. Eckhaus Latta has packaged gender and class commentary for men, women, and the gender non-binary person from the outset. Over the years, they’ve garnered a following for their post-Margiela aversion to contemporary fashion, where ‘pretty’ is not part of the vernacular but the words ‘asymmetric’ or ‘deconstruction’ are more likely to be found. Nowadays, their focus is much more on designing an impressive product that uplifts their raison d’être as opposed to solely focusing on cultural commentary, which isn’t a bad thing. They have to push things forward if they want to continue to lure audiences to Bushwick on a Saturday afternoon. They were nominated for the ANDAM Fashion Award and the LVMH Prize recently. With two flagship stores and a host of worldwide stockists, the pressure is on to sustain the momentum. And they did just that. It was still very much an Eckhaus Latta collection. Furs that looked more like roadkill than exotic animals; fleeces that looked positively ordinary in lieu of a glossy, expensive exterior; knitwear patchworked like it had been purloined from a bin of deadstock fabrics; and jeans that looked like weathered the aftermath of an excitable spray-painting session. Moreover, cue a collaboration with UGG. Square-toed backless UGG heels? A savvy collaboration for Eckhaus Latta, enhancing their narrative as the brand that riffs on bad taste. What they manage to do to all of the above is making it desirable. 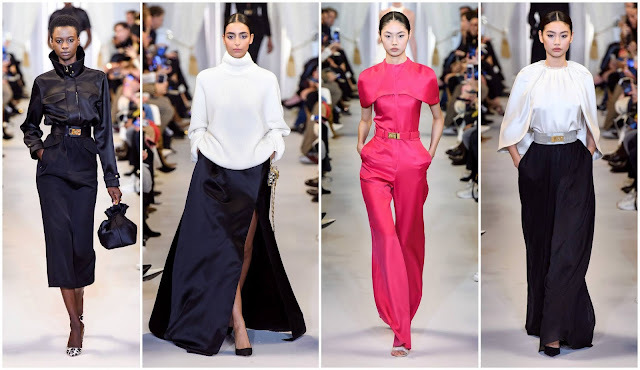 Furthermore, they perfected slick tailoring and it produced a polished exterior, a departure from the bric-a-brac mood one has come to expect from the duo. Of course, their ‘rough around the edges’ cool remains, but a grown-up wind prevails. Brandon Maxwell is the antithesis of Eckhaus Latta in terms of aesthetics, but they are one and the same in the way they generate interest in contemporary American fashion. Maxwell, a Texan, is the lovechild of Ralph Lauren and Carolina Herrera with the spirit of your grandmother. He delivers fashion for the high society like he’s been practicing for decades. This season was no different. He could be the next household name. He’s warm and charming, he’s gracious and inviting, he’s got America’s sweethearts supporting him on the red carpets, and stores such as Saks Fifth Avenue, Nordstrom, and Bergdorf Goodman are lining up to have him in their stores. Not to mention, he produces a plus-size range for retailer 11 Honoré. And at the end of Saturday’s show, he took his bow with his mother and his team of seamstresses. Wholesome. For fall, he stripped things back to black and white—albeit with an occasional pop of cerise and lime green. He noted a family illness had put a dampener on things. Yet, he continued on with some familiar silhouettes, strengthening his sharp perspective. There were satins shirts with high collars, slinky tank dresses with pencil skirts, ribbed turtlenecks over duchesse satin skirts, and a slew of functional daywear options punctuated by cigarette trousers. There wasn’t much development but it’s worth sticking with consistency in the early stages of your career. With a restricted colour palette, Maxwell allows the silhouettes to do the talking. His point of view doesn’t falter.